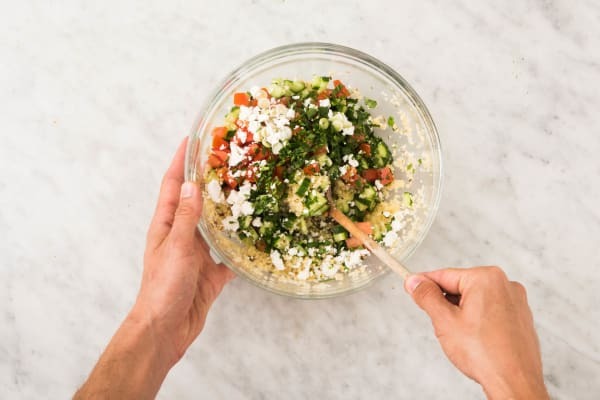 Tabbouleh is a Middle Eastern salad that features bulgur wheat mixed with chopped herbs, lemon juice, and veggies—you could think of it as an edible garden in a bowl that’s as wholesome as it is tasty. 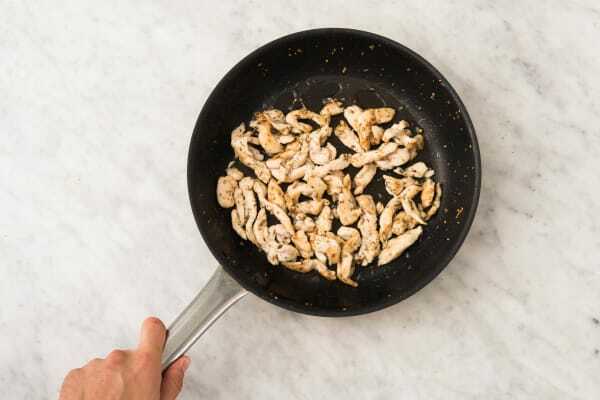 In this recipe, all that freshness provides a nice contrast to the savory flavor of chicken coated in dukkah—a blend of seeds, nuts, and spices that gives the meat a finishing layer of texture and aromatics. 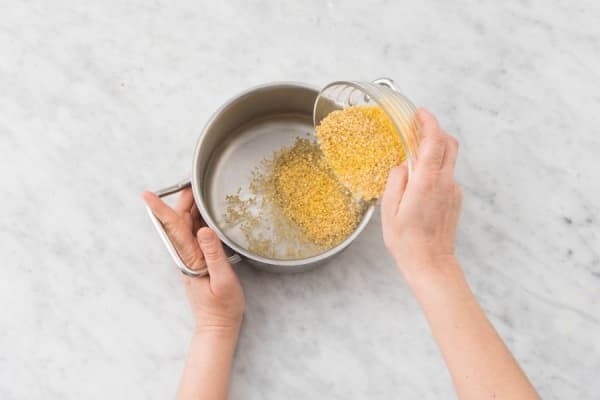 1-Add bulgur and 2 cups water to a small pot and place over high heat. Bring to a boil, then cover and reduce heat to low. Let simmer gently until water is absorbed, about 12 minutes. Keep covered off heat until step 5. 2-Wash and dry all produce. While bulgur cooks, trim ends of cucumbers, then quarter lengthwise before cutting crosswise into small triangles. Cut tomato into small cubes. Trim, then thinly slice scallions, separating greens and whites. Finely chop parsley. 3-Zest lemon, then cut into quarters. Squeeze enough juice into a large bowl to give you ¼ cup. 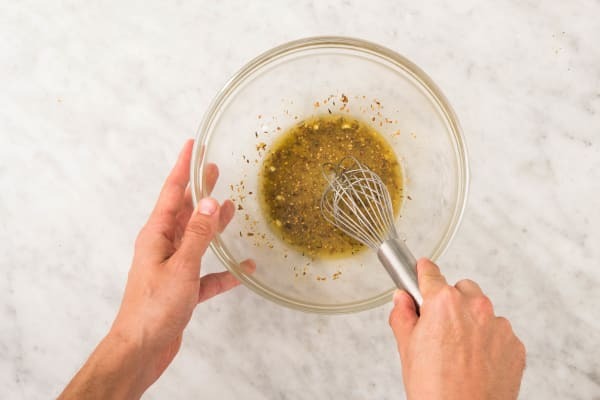 Using a whisk or fork, whisk in zest, ¼ cup olive oil, and 1 tsp dukkah (save the rest for the next step) until well combined. Season with salt and pepper. Set aside. 4-Pat chicken dry with a paper towel, then place on a plate and sprinkle with remaining dukkah, a pinch of pepper, and a few large pinches of salt. Toss to coat chicken evenly. Heat a large drizzle of olive oil in a large, preferably nonstick pan over medium-high heat. Add chicken and cook, tossing occasionally, until browned on surface and cooked through, about 5 minutes. 5-Fluff bulgur in pot with a fork. Season with a few pinches of salt and pepper. 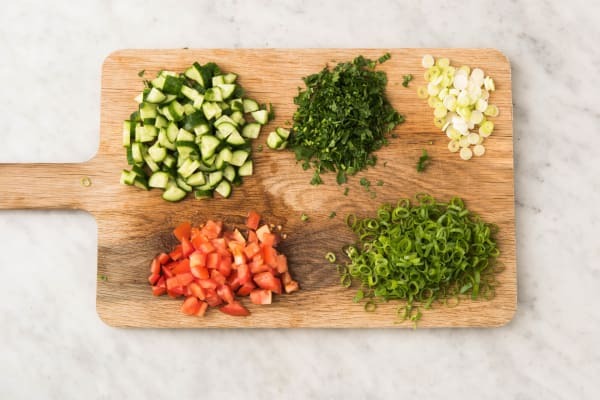 Add to bowl with lemon dressing, along with cucumbers, tomato, scallion whites, and parsley. Toss to combine. Gently stir in half the feta cheese (save rest for garnish). Season with plenty of salt and pepper. 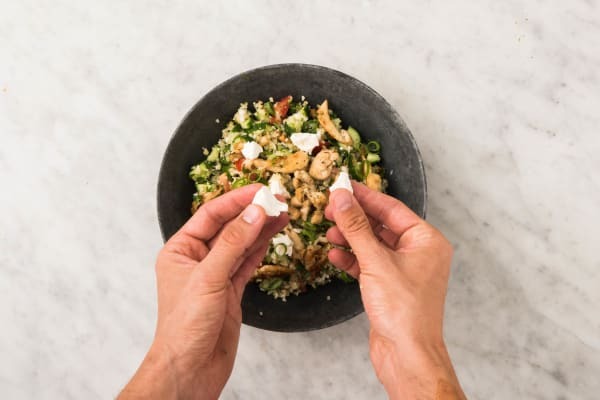 6-Divide tabbouleh between bowls, then arrange chicken on top. Garnish with scallion greens and remaining feta cheese. Serve with any remaining lemon on the side.